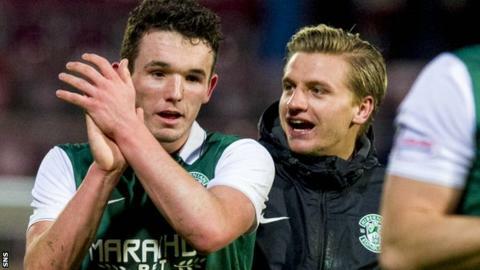 Hibernian midfielder John McGinn is playing himself into contention for an international call-up, Scotland coach Stuart McCall has told BBC Scotland. The Scots have forthcoming friendlies against Czech Republic and Denmark. "Obviously we've got a couple of double headers coming up at the end of March and we'll watch his form between now and then," McCall told Sportscene. "But he's certainly one we've got our eye on and he's playing well. He's been discussed. He's on the radar." McGinn switched to Easter Road from St Mirren in the summer following the Paisley club's relegation from the Scottish Premiership. The 21-year-old has helped Hibs vie with Rangers for the Championship title and the Edinburgh side lie second, eight points behind their Glasgow rivals. They have also reached the Scottish League Cup final, in which they will face Ross County, after McGinn scored the winning goal against St Johnstone in the semi-final. McGinn has already represented his country at under-19 and under-21 level.